Before I sat down and started to think about structuring this post for your reading pleasure, it came to my mind that maybe I should make it easy for myself and simply title this one as ‘WordPress is SEO friendly out of the box’, publish it and forget about it! That would more or less do the job! That’s it, as simple as that! But then again… it took a while since my last post (quite busy with website design in here! ), so… once I have found some free time I may as well grow this post a bit bigger and point out few more facts for you about WordPress framework structure, and why it’s so damn good for all your SEO needs! In my previous posts (Part 1 & Part 2) I have focused more about website design advantages and flexibility of WordPress framework and how this CMS finds itself comparing to other competitive website design frameworks on the market. Shortly speaking, this is the welcome message search engines see when they find a website build on WordPress. Isn’t it nice & inviting? Not only search engine passing by gets invited to start their indexing process, they also get a guidance on how to do so! WordPress functions & features guide a search engine through the content (pages, posts, categories… you name it!) to help it crawl the website design by collecting information search engine needs to include the site within its database. By default WordPress comes in with many build-in search optimisation tools, like readable and canonical URLs, meta data, feeds, ability to use .htaccess and robots.txt files to tell search engines what to crawl and what not, to not waste their time. All that is there, from the start! All you need to do to not break any of those search engines super friendly features, is to follow few simple rules, both from coding and content point of view. I’m going to focus more on the value of the content you write and how to write it to not break what’s given to you out of the box (SEO friendliness) when using WordPress as your website design framework, since most likely that’s the main focus area that you would like to know more about. Keep the coding clean – bad coding, wrong structure, errors in the code – all that can simply prevent search engines to crawl the website successfully, what in the end can cause all that valuable content that is supposed to be ranking high and is there to bring the value for visitors, to not be picked up by search engines. This is why we strongly advice using HTML (used to make it all work and read well) and CSS (used to make it all look pretty!) validation tools in developing process. Use good navigation structure – remember ‘Hi, please get in, let me show you around!’? Navigation links are one of the most important points of any website both from search engines and visitors point of view. The better it’s structure the more inviting it will be for search engines to find their way through the content, the easier it will be for them (both visitors & search engines) to find any related content and to decide which parts of the website bring more value for visitors and as such should get higher value and rank higher – so they could be found easier! Develop for multiple browsers – in a perfect world all browsers would render the website the exact same way, unfortunately we can only hope for this kind of paradise, so they don’t! Have that in mind when developing and make sure to check how your project performs on multiple browsers to make sure everything appears correctly. Believe me, it’s best to catch any problems ahead of time instead of relying on visitor complaints. While it can be time consuming, it’s by far faster and easier than trying to fix or change the coding later! Test, test and test again after that! – remember, as much as you’re good at your job and your coding skills are way beyond the standards, you’re not quite suited to test the effects of it well (Weinberg’s law)! After you have worked on this new project of yours for weeks, you can’t really look at it it from a fresh perspective anymore. You know how it is built and therefore you know exactly how it works, but it’s only the wisdom that not involved in project testers and visitors of the website would not have. So, ask fellow developers in the room to take a good look at your work, ask someone less skilled in coding to take a read through, keep frequent contact with the client (future website owner) and do ask them for a review once a while. Basically – If you want a great website in your portfolio, you’ve got to test. 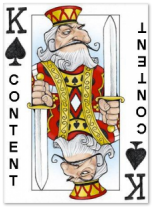 Back to the topic – Never forget about The Content! Keep in mind – this post is more about Search Engine Optimisation of your website, less about making the website optimised for visitors needs and usability. While both are connected in a way – there are differences. I’m focusing here more on ‘how to get the visitor to your website’ part and less on ‘how to keep them there’. Stay tuned to my blog and soon enough you’ll find a post in which I will focus more on attractiveness of your website – what you can do to convince your visitors to keep coming back for more! First let me bring a bit of light as to how exactly search engines work. Opposite to what visitors experience when landing on your website, search engines do not ‘see’ a site, they can only ‘read’ it. What that means is that from their point of view it’s not so much about your website being ‘pretty’ that attracts them, it’s more about what’s written – your content is what ‘talks’ to search engines! All the material on your website – words that you use to explain, inform, share or educate the visitor – needs to read well and be of a high quality! It’s what search engines use to examine and compare with all the parts & pieces to give your website a good ‘score’. Ok, now… this post became longer that it was originally intended! So, to keep you focus, and to show you how important it is to keep in mind how search engines see your content when writing, I’ve decided to move the main message to a new post! The idea behind it is that you need to follow few simple rules (that means I have to follow them as well! ), so your content can be picked up easier by search engines and what comes with it – easier found by your readers! So, here it is! Follow this link for – Your simple guide to Search Engine Optimised Content!